DISCOVERIES IN SCULPTURE was a challenge to both mind and eye to perceive new identities in old recognizable forms. Eventually, one discovers that to the mind there are no absolutes. What is seen is composed of self-imposed images just as what is thought is composed of self-imposed concepts. The ultimate revelation of the nature of the mind comes when you realize that Being itself is a self created invention. "An extraordinary vision of life. There’s a lot to be said and it really can't be expressed by words but the art speaks for itself. It was very fattening (sic) to one's eye and spirit. Love it." 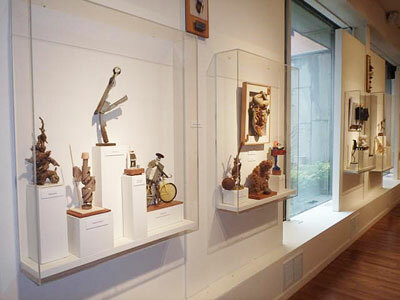 "Here is a wide range of imagination, a display of humorous inventiveness, the creative use of found objects, a sensitive and mature grasp of design, including form, textures, and the striking use of many different materials... and finally, a tremendous variety and wealth of conceptual ideas." "Your slide lecture... was excellent. Your ability to relate Science, sociology, technology and psychology to contemporary was both educational and intellectual... You should consider packaging your presentation for educational television." "What an outstanding demonstration and lecture you gave to the upper grade children last week! Your slides and your talk were extremely informative. You could tell be the expressions in the children’s faces that they were absolutely mesmerized by the creations that you have put together. " "We had several comments on the quality of the program, the high interest the children showed in found object sculpture and the depth of your obvious talent and imagination. We look forward to having you return soon." The exhibit will run through October 2016.